DRG 86 283, Orenstein & Koppel 12941/ 1937; I took this photo at the Deutsche Dampflokmuseum, Neuenmarkt, Germany, on July 30, 1996. Another picture of 86 283, this time on static display; May 1, 2014. 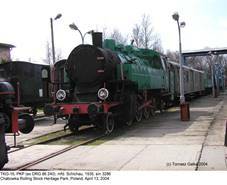 TKt3-16, ex 86 240, Schichau 3286/1935, can now be seen in Chabówka loco depot; photo taken on April 13, 2004. Side drawing of early version (86 017 to 233), drawing by M.Ćwikła from SK vol.2/ 2003. … and final version (ÜK); side drawing by M.Ćwikła from SK vol. 2/2003. Another picture of the TKt3-16, taken on July 29, 2006. TKt3-42, photographed somewhere in Poland in January 1961. Photo from my collection. 86 002, DRG, MGB Karlsruhe 2357/1928. Probably this is a factory photo. 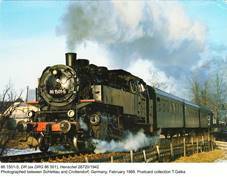 DR 86 1501-1 (formerly 86 501, Henschel 26720/1942), photographed between Schlettau and Crottendorf, Germany, in February 1988. In June 1992 this engine was sold to ÖGEG. Postcard from my collection. More photos of Class 86 engines in the DR service can be found here. Another picture of the 86 501, with Austrian-style service number 86.501. Taken over by ÖGEG, it can now be seen at Lokpark Ampflwang. Photo taken on August 25, 2016. DB 086 808-3 (former DRG 86 808, WLF 9528/1943), location and date unknown. This locomotive was withdrawn in December 1971. Postcard from my collection. Another picture from my collection: factory photo of the 86 100 (BMAG 10136/1933), taken in January 1933, probably at the manufacturer’s premises. This locomotive served with DB after the war and was withdrawn in September 1965. DRG 86 720 (Krupp 2871/1942) represents the interim ÜK wartime version; this engine was withdrawn from DB in March 1966. Location and date unknown. Source: Die Lokomotive September 1943. Tank locomotives with the 1-4-1 axle arrangement were very popular in Europe and German class 86, of which almost 800 were built, was among them the most numerous type. 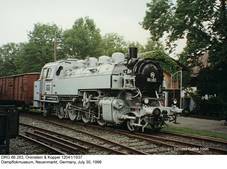 Its origin can be traced back to 1924, when German railway authorities decided to introduce several normalized standard-gauge locomotive classes (Einheitsbauarten), covering the entire range from small switchers to heavy freight locos and fast express engines. This decision, leading to development of entirely new machines, might have seemed surprising: Prussian manufacturers, who by far dominated locomotive design in Germany before 1918, had been able to supply modern engines which compared favorably with that used in other European countries. Standardization was, however, given priority. 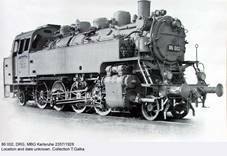 As a result, in late 1930s DRG had, in general, very modern locomotives. 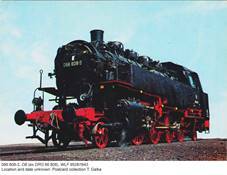 Among other types, it was decided to develop a 1-4-1 tank locomotive for local heavy freight traffic, with axle load not exceeding 15 tonnes, to replace Prussian classes T14 and T141. Many elements and sub-assemblies were intended to be interchangeable with that of classes 24 and 64, also designed for local traffic, but lighter. 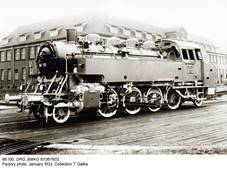 Design of the new machine, designated class 86, was submitted in 1927 and production started the next year, first seven machines being supplied by Maschinenbau-Gesellschaft (MBG) of Karlsruhe. As with other normalized German types, production, which lasted until 1938, was scattered among several companies, to keep them busy. In the case of class 86 there were nine of them: MBG (11 machines), Linke-Hoffman (5), Schichau (118), Krupp (17), Maschinenfabrik Esslingen (23), Borsig (38), Henschel (53), BMAG (18, including one for a private railway) and Orenstein (18); first two of them failed to survive the Great Crisis. Thus, during eleven years, production reached just 301 examples. After Anschluss, further 77 examples were ordered from WLF (Floridsdorf) and delivered in 1939; this company eventually became the largest source of 86s, supplying 191 machines until production was finally terminated in 1943. 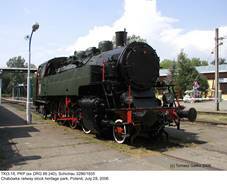 Also former Cegielski (HCP) works of Poznań, renamed DWM Posen, joined in 1942 and built 73 examples (86 456 through 487 and 86 835 through 875). Wartime deliveries from Krupp (45), Borsig (22), Henschel (40), BMAG (57) and MBA (formerly Orenstein & Koppel – 46) brought total output to 775 examples. 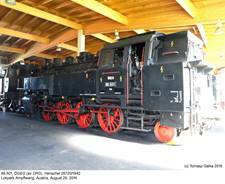 In 1943 all remaining orders were cancelled and, as certain sequences of service numbers had already been reserved, the last machine was accepted as 86 966 (86 1000 was built for Eutin-Lübecker Eisenbahn in 1938 and impressed into DRG in 1941). There were several modifications, including steel firebox (from 86 230 onwards), gradual introduction of welding instead of riveting, modified water and coal boxes, several variants of brakes (it was intended to increase maximum speed) and many minor changes. After successful tests, Bissel semi-truck was supplanted with Krauss-Helmholtz truck from 86 338 onwards, which considerably improved running qualities. Externally, three major versions can be distinguished: original one with small cutoffs in water boxes, the second one (from 86 378 onwards) with much longer cutoffs and final wartime ÜK (Übergangs-Kriegslok), introduced in 1941, with simplified cab and smoke-box door and several equipment items removed; compared to the original variant, they were slightly lighter. After WWII most of these locomotives remained in Germany, with DB (about 385 examples, in use until 1974) and DR (about 175, in use until 1976). About twenty machines were destroyed during hostilities. Several were taken over by Austria (27 examples, class designation unchanged), Czechoslovakia (69 examples, 26 of which were impressed into ČSD as class 455.2 – the last one was withdrawn in 1957, some went to industry) and Soviet Union (according to Kurt H. Miska, over 90; an older source gives 46 examples). In 1945 Poland took over seven engines built in Poznań, which were, by default, considered Polish property. In 1951 one more followed, from Czechoslovakia. 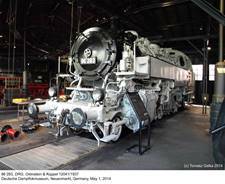 Furthermore about 40 German-built locomotives of this type were impressed into service. 46 examples were given PKP service numbers TKt3-1 to 46; at least one more (Schichau 3284/1935) was not repaired and finally scrapped. Most of TKt3s were used in southern Poland, on mountain lines with comparatively weak tracks; they were well suited for such service. Even on poor and uneven tracks their running qualities were considered very good. Despite their designation, many of them hauled passenger trains and due to fast startup and sufficient tractive effort were particularly suitable on suburban lines. With mounting supplies of indigenous TKt48s, designed basically for the same tasks, they were gradually shifted to switching. Eight examples were written off before 1965, half of them (TKt3-16, -20, -21 and -41) being transferred to collieries; two more (TKt3-1 and -25) served at railway depots. 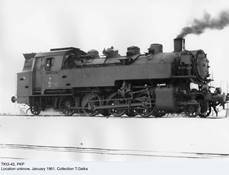 It was intended to withdraw all remaining locomotives of this type until 1972 and in fact only two survived in the PKP service for longer: TKt3-11 (ex 86 158, Borsig 14486/1934) was written off in March 1974 and TKt3-15 (ex 86 239, Schichau 3285/1935) in January 1975. TKt3-16 (ex 86 240, Schichau 3286/1935), transferred to Zabrze colliery in 1964, remained in use there until October 1982; this machine, the last Polish TKt3 in service, has been preserved at the Chabówka rolling stock heritage park and is still there on static display. All other examples were scrapped. TKt3 was a versatile and useful machine. Its successor, TKt48 (with the same axle arrangement), was slightly longer and heavier by some 10 tonnes, with comparable output and tractive effort; due to higher boiler pressure, however, overall characteristic were improved. 1) Some sources give 744 – probably just a mistake. 5) 66 850 kg for ÜK. - http://www-personals.umich.edu/~khmiska (Kurt H. Miska’s website – currently inactive).